Make your throne room shine. The bathroom can easily be the busiest room in the house. Not only that, but it’s often the place where we make ourselves presentable to the outside world: women with makeup, men with facial hair trimming, etc. This makes even, smooth bathroom lighting an absolute must! You can’t look your best if half your face is in shadow. 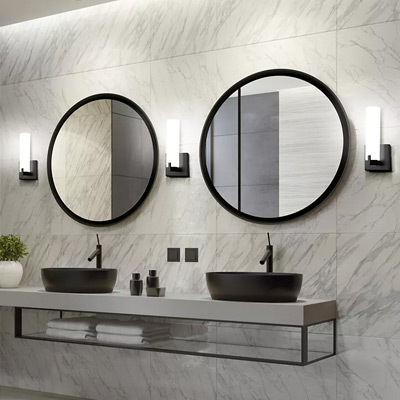 And what better way to complement your bathroom light fixtures than with stylish hardware, storage furniture and the accessories needed to give the space a personality? Here you'll find bathroom design ideas to transform your throne room from strictly functional to a place of comfort and style. 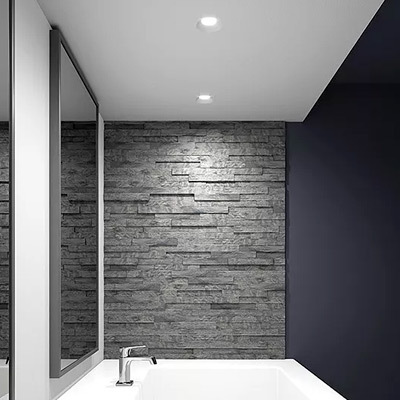 For the longest time, bathroom lighting has been largely confined to linear fixtures over mirrors and the occasional recessed light over the shower. But this selection of decorative lighting allows you to get creative with the placement of the light fixtures in your vanity. 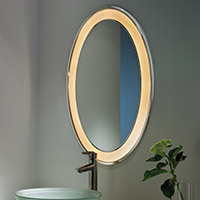 As bathroom decor has expanded, so have the options for vanity light fixtures, and now we have many more options, from mirrors with built-in lamps to paired pendant lights on either side of a vanity mirror to full-on chandeliers if you’ve got the guts (and the room) for it. 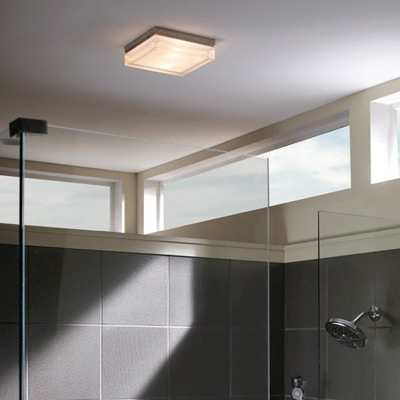 You may also appreciate the understated beauty of a flush ceiling light and although recessed lighting is a more ambient source of light, these fixtures will pair well with your other choices of lighting. With the right lighting in place, you'll enjoy getting ready in the morning. 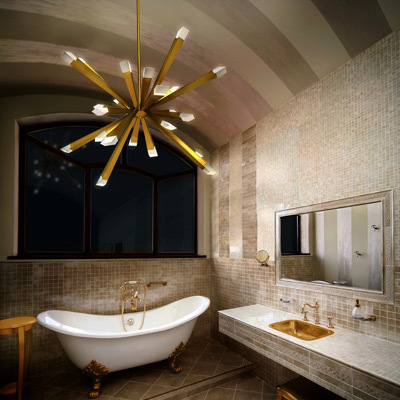 And if you want to give your thorne room a bold personality, consider a bathroom pendant light. Designing a modern bathroom isn't all about the lighting. Elegant bathroom decor can be achieved through well-designed storage, shelving, stylish hardware and all of the accessories that help you get yourself going in the morning. 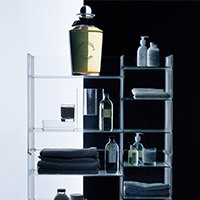 Kartell's storage furniture is a go-to choice for contemporary organization in a space where cleanliness is critical. 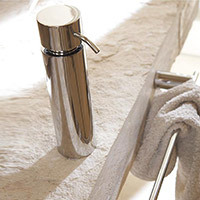 Vanity accessories like soap dishes, cosmetic mirrors and tissue boxes serve a functional purpose while highlighting the character of your bathroom. The right hardware is essential too! Consider installing towel racks, towel holders, toilet paper holders and wall racks to round out the look of the space. 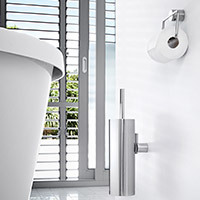 Most accessories and hardware from Blomus belong to larger product collections, making it easy to decorate the bathroom in one fell swoop. Lastly, give your floors some personality with fun bath mats. Before fully remodeling your bathroom, consider how its decor impacts the rest of your home. You may want to follow a similar design style as other rooms in your home, be it mid-century modern or more of a rustic look and feel, and can find the right lighting and furniture to match your vanity room. You'll also want to be mindful of finding products with similar finishes. 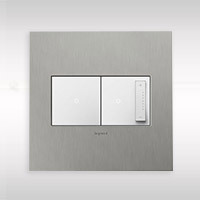 For instance, you'll want to avoid having chrome lighting fixtures mixed with bronze hardware. Finally, with fixtures and furniture selected, why not consider a fresh coat of paint on the walls to tie everything together? Remember, darker tones will make the room feel smaller while lighter colors will provide the opposite result. 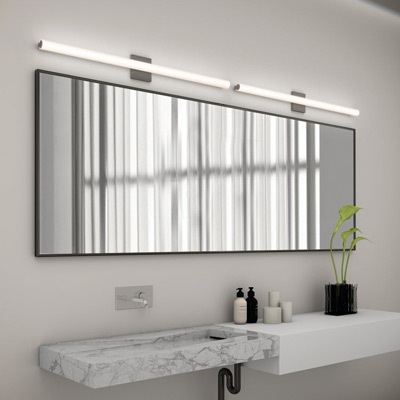 Tech Lighting's Arris Wall Sconce brings clean, angular style to the bathroom with a frosted, molded rectangular glass shade and sharp metal details. 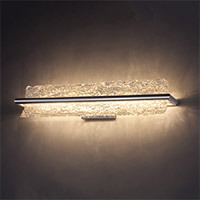 Dimmable integrated LED source and ability to be mounted horizontally or vertically allow for versatility.